This year Alabama Pediatric Dental Associates & Orthodontics held a canned food drive in our Huntsville and Madison locations. Each patient was allowed to bring in up to 20 canned food items for a chance to win $100. Our patients donated a total of over 400 cans! Check out the picture of all the cans that were donated. 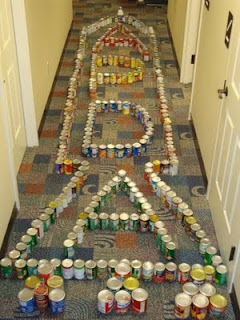 Our staff members helped arrange the cans in the shape of our logo, a rocket! We are so proud of our patients and we thank them very much for opening up their hearts and wallets to help our community with their donations. -The Doctors & Staff at Alabama Pediatric Dental Associates & Orthodontics. I would like to leave comment the "space maintainers" bu I couldn't.Anyway My son he is almost 5 he had a spacer on the back(for only one teeth) on May 2009 and he lost it(December 2009)should we replace it?Because insurance not cover the second spacer.what is the advantage or disadvantage? Each case is different. I would encourage you to consider your dentist's recommendations. Dentistry, specially pediatric dentistry is a good job!